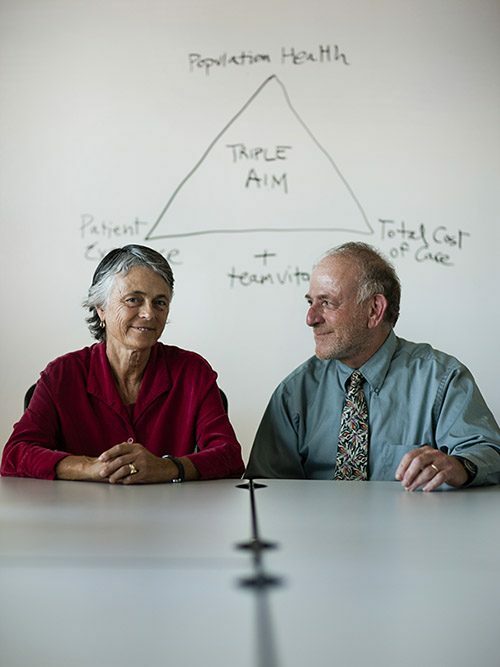 When physicians Ann Lindsay and her husband, Alan Glaseroff, arrived in Palo Alto five years ago, they were on a mission: to provide better care at lower cost to the sickest and most complex patients served by Stanford University’s employee health plan. Impressed by their design of care for patients with chronic conditions, the university invited them to establish the Stanford Coordinated Care clinic — and the impact was substantial. After six months under the couple’s model, the overall cost of health care for the first group of 253 patients dropped by 13% compared to the previous six months, largely due to a 59% drop in ER visits and a 29% drop in inpatient admissions. It’s possible that none of those accomplishments would have happened if the pair hadn’t participated in the California Health Care Foundation (CHCF) two-year leadership program, now in its 17th year. Led by national experts in health care and leadership development from the Healthforce Center at UCSF, the leadership program addresses health care issues from the perspectives of business management and public policy. Fellows broaden their management skills and sharpen their leadership capacity while gaining insights into the trends and challenges facing health care in California. And alumni become part of a network that continues to collaborate and develop its skills. Glaseroff and Lindsay say the leadership program surprised them by profoundly changing the way they view their work — and the way they see themselves. In 2000, Glaseroff was a primary care physician with a side gig as chief medical officer of the newly formed Humboldt IPA, an independent practice association representing 240 physicians — almost every doctor in Humboldt County. Humboldt hugs 110 miles of California’s rugged northern coastline and is home to about 135,000 people. “I was so frustrated with my inability to move forward quickly that I was ready to say, ‘To hell with it,'” he said. “I thought I’d just go back to my practice and play more guitar.”The job had been grueling, and as head of the group he was the target of criticism. At the same time, Glaseroff found himself hamstrung by the IPA’s board, which didn’t always agree that the IPA should spend members’ money on quality improvement projects that otherwise would be used for physician reimbursement. Instead, he applied to join the inaugural class of the CHCF Leadership Program, and he was accepted. It began in 2001. The program taught practical things: how to schedule time more effectively, how to be a better speaker, and, for Glaseroff, how to strategize tactfully to turn a board to one’s point of view. What mattered most to Glaseroff was learning that his personality type “fit with all the most effective leaders.” By the end of the program, Glaseroff had launched a leadership initiative that became the Humboldt Diabetes Project, with the support of CHCF. That money, and the tools he learned in the program, convinced his board to move ahead with it. Because of the project, most of the people with diabetes in Humboldt County saw their blood sugar stabilize within a normal range, a phenomenon that continued as recently as 2011, the last year for which public data is available. He felt reinvigorated in his work with the foundation, and he was being asked more and more to participate in national and statewide initiatives. After years of largely grant-funded success, his work came to the attention of Professor Arnold Milstein of the Stanford School of Medicine. Milstein, an expert on scalable health care delivery innovations, invited Glaseroff to create Stanford Coordinated Care. While Glaseroff was attending the leadership program, Lindsay worked both in the medical practice she shared with her husband and as the Humboldt County public health officer. She had already attended the National Leadership Academy of the US Centers for Disease Control and Prevention, and she had set up the California Leadership Academy for the Public’s Health with support from The California Endowment. And for years, Lindsay had worked closely with public health officers around the state to lobby for policies to improve health outcomes and address social determinants of health. “She was responsible for needle exchange passing statewide and many other things,” said Glaseroff. In 2012, Lindsay and Glaseroff accepted Milstein’s invitation to join Stanford Coordinated Care. For the first time, she was in her husband’s shadow. And while she’d had extensive leadership training and done important things with it, her credibility didn’t transfer with her to Stanford. She found she needed a new approach and more training to convince colleagues that the team approach was the right one. So Lindsay applied to CHCF’s leadership program. Unlike most of the other fellows in the leadership program, she was already familiar with the legislative process. What she got from the fellowship, she said, was a chance to look at her leadership style anew and recommit to her vision. Her fellowship project created a team training center that could export Stanford Coordinated Care’s approach. But the most important thing she gained from the leadership program was the will to persevere against roadblocks, Lindsay said. Like Glaseroff, Lindsay said that the fellowship evaluation process helped improve her effectiveness — in her case, enhancing her ability to quantify the program’s positive impact. The leadership program also hosted monthly meetings with other Bay Area fellows who urged her to keep going. When her leadership program cohort elected her as the class’s representative to the fellowship alumni board, it was another vote of confidence. Today she is the board’s president. The fellowship not only allows you to step back and look at your own career from a different light, it also puts your work in a bigger health care context. The CHCF Health Care Leadership Program transforms today’s clinicians into tomorrow’s leaders. Up to 32 physicians, nurses, dentists, pharmacists, and other health care professionals are selected annually for this two-year, part-time fellowship. Applications for the next leadership program cohort are being accepted until June 30. Candidates should have a clinical license and at least five years of experience in health care management or leadership roles. For more information about the program and current and alumni fellows, and for complete application instructions and forms, visit the Healthforce Center website. Heather Boerner is a health care writer. Her work has appeared in Washington Monthly, The Washington Post, PBS NewsHour, The Atlantic, and The Daily Beast. Heather’s book, “Positively Negative: Love, Pregnancy and Science’s Surprising Victory Over HIV,” was published in 2012.